When I earlier reviewed the PlanetBox BottleRocket, I wrote," The only suggestion that I could make, would be to make it also available in larger sizes in addition to the present size of eleven ounces." Now, here it is! The very nice people over at PlanetBox generously sent us their new, larger, Planetbox BottleRocket water bottle. I am very pleased to introduce their 18.8 oz. PlanetBox BottleRocket Booster, which, along with the 11 oz. 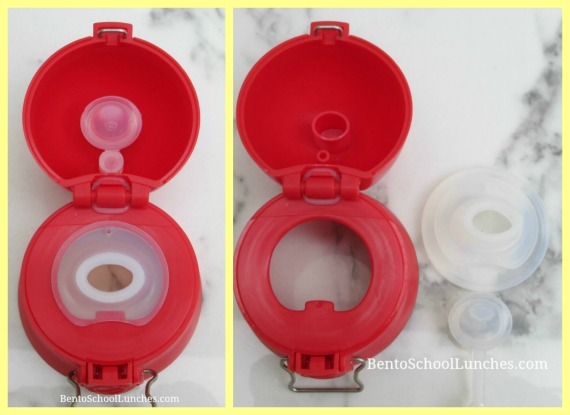 Capsule, provides two great options for keeping hydrated. We have been using the smaller BottleRocket, from PlanetBox, almost every day for a year now and, believe me, it is still in perfect condition! Let me put it this way, ALL of our PlanetBox products are still in perfect condition. 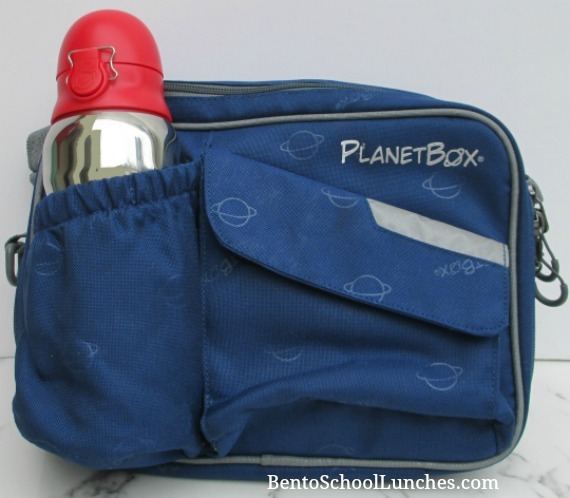 If you have been following our blog, you'll see that we've used our Planetbox Rover quite often and the lunchbox is still in like new condition after all these years, just AMAZING. That is what we refer to as fantastic quality! Let me continue with this review before I get side tracked writing about how much we love our PlanetBox products. Below is a picture of the smaller BottleRocket Capsule and the new BottleRocket Booster for comparing their size. They both share wonderful design and features I appreciate. 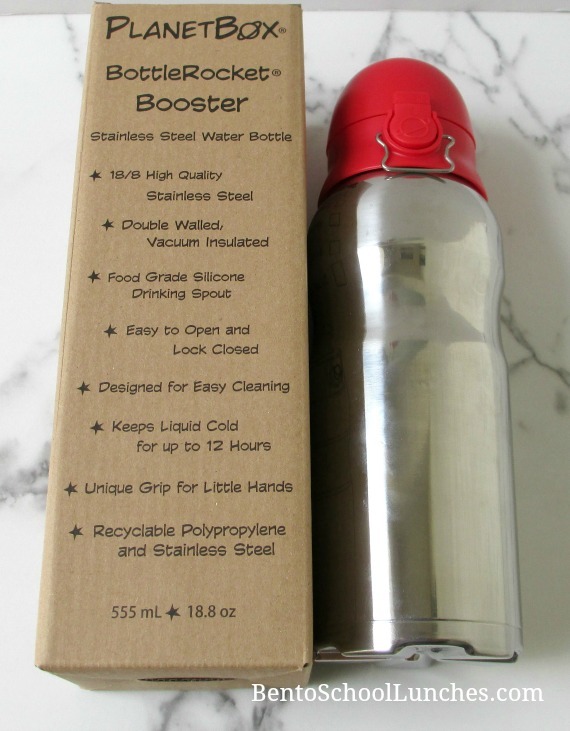 The Booster water bottle is great for both kids and adults alike. I am thrilled to discover that it is available with pink caps. You all might already know that pink is my favorite color! I'll have to get the pink one for myself! Here are some of the things I think you also will like about the stainless steel Bottle Rocket Booster. It is truly leakproof and the contents remain COLD for up to 12 hours even in our famous Florida heat. It's double walled and vacuum insulated which means it does not sweat so no wet slippery fingers or water rings on the table. The cap keeps the spout clean and sealed, yet they are easy to open with just the push of a button even for young children. To avoid accidentally opening, there is an easy to use locking mechanism. It is comfortable to hold and can be carried in most cup holders or bottle cages almost anywhere. The photos below show the cap. 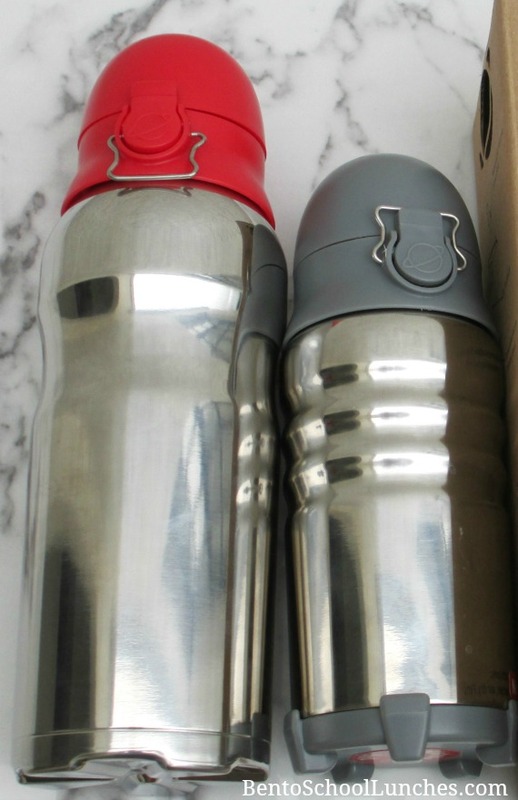 On the left you can see the clever design of the spout which dispenses easily and quietly yet seals completely. On the right you can see how the cap is taken apart for thorough cleaning. 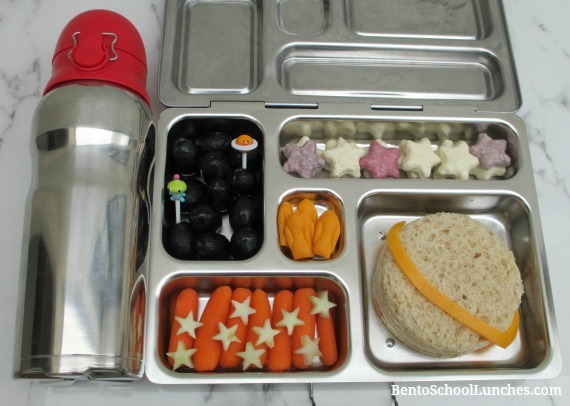 Below is the PlanetBox BottleRocket Booster paired with the PlanetBox Rover lunchbox to deliver a space themed lunch which consists of a large planet sandwich with cheddar cheese ring, organic baby carrots with cucumber stars, seedless grapes with cute space food picks, yogurt covered stars and some cheddar rocket shaped crackers. Like the Capsule, the Booster also fits nicely in the PlanetBox Carry Bag as you can see in the photo below. PlanetBox has durable and high quality products, and their new water bottle, the BottleRocket Booster, is another excellent example! I am sure that it can last for many years to come! Disclosure: PlanetBox generously provided me with the product without cost to me. Other than receiving the product, I have not received any compensation to write this review. All opinions are my own. This is what we need since my kids are older now! Great lunch!